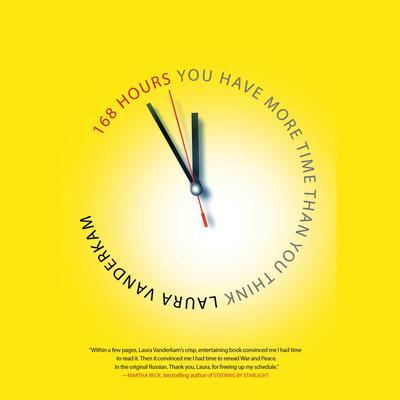 There are 168 hours in a week. This book is about where the time really goes, and how we can all use it better. It's an unquestioned truth of modern life: we are starved for time. With the rise of two-income families, extreme jobs, and 24/7 connectivity, life is so frenzied we can barely find time to breathe. We tell ourselves we'd like to read more, get to the gym regularly, try new hobbies, and accomplish all kinds of goals. But then we give up because there just aren't enough hours to do it all. Or else, if we don't make excuses, we make sacrifices. To get ahead at work we spend less time with our spouses. To carve out more family time, we put off getting in shape. To train for a marathon, we cut back on sleep. There has to be a better way-and Laura Vanderkam has found one. After interviewing dozens of successful, happy people, she realized that they allocate their time differently than most of us. Instead of letting the daily grind crowd out the important stuff, they start by making sure there's time for the important stuff. They focus on what they do best and what only they can do. When plans go wrong and they run out of time, only their lesser priorities suffer. It's not always easy, but the payoff is enormous. Vanderkam shows that it really is possible to sleep eight hours a night, exercise five days a week, take piano lessons, and write a novel without giving up quality time for work, family, and other things that really matter. The key is to start with a blank slate and to fill up your 168 hours only with things that deserve your time. Of course, you probably won't read to your children at 2:00 am, or skip a Wednesday morning meeting to go hiking, but you can cut back on how much you watch TV, do laundry, or spend time on other less fulfilling activities. Vanderkam shares creative ways to rearrange your schedule to make room for the things that matter most. 168 Hours is a fun, inspiring, practical guide that will help men and women of any age, lifestyle, or career get the most out of their time and their lives.